Clark Honors College Professor Mark Carey’s Glacier Lab is one of a kind. “I have never heard of any historian, at any university anywhere else, that has a lab or a group like this,” Carey said. The Glacier Lab is a social science lab run by Carey, a historian by training, and a team of undergraduates, graduate students, doctoral candidates and postdoctoral students. The lab has a focus on the study of ice and its effect on the human experience, but Carey also focuses on the betterment of his undergraduate team members through mentoring. The collaborative environment of the lab has led to two undergraduate honors college students, Becca Marshall and Augustine Beard, winning Humanities Undergraduate Research Fellowship grants—a 16-week fellowship that funds independent research. Beard won the fellowship in winter 2016 and Marshall started her fellowship winter 2018. 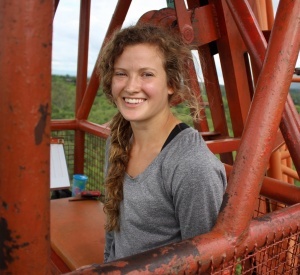 Marshall will present her research on mushroom harvesting in Oregon, which she conducted through the Glacier Lab and fellowship, during the Undergraduate Research Symposium in May. Beard also won a 2016 Vice President for Research and Innovation undergraduate fellowship, which Carey mentored, for his research inspired through the Glacier Lab. While both Marshall and Beard started as research assistants helping Carey with his glacier and society research, the direction of their individual projects have diverged from the lab’s ice focus. 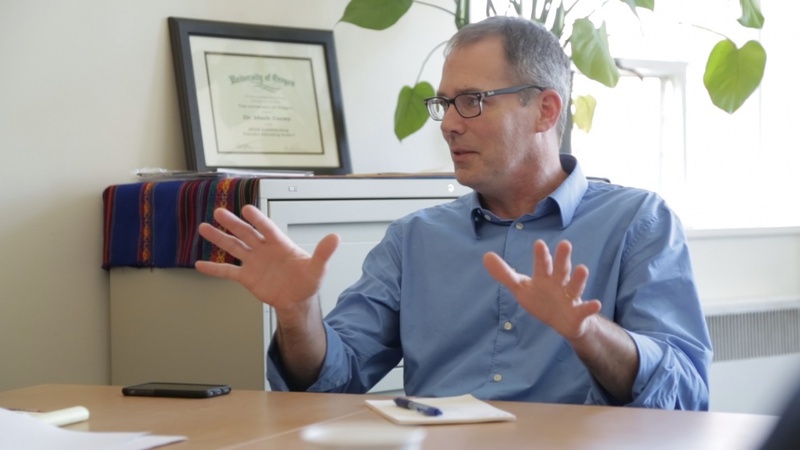 “We’re all pursuing our own interests, I think what unites us is most of us have researched with Mark, but the lab itself is us working on our own research and workshopping that and getting feedback from other members,” Marshall said. As the Glacier Lab team has grown, Carey has been deliberate in choosing students whose personalities add to the positive learning space. The group regularly reviews each others’ publications, resumés, grant proposals, essays, cover letters and more. “We looked at a draft of a grant proposal for one of our members, Holly Moulton, and she just got the grant, so it’s been a great experience helping workshop and provide feedback for other Glacier Lab members’ work and then seeing their hard work pay off,” Marshall said, referring to the Tinker Field Research Grant through the Center for Latino/a and Latin American Studies. “Also it’s inspiring, as an undergrad, to see higher-level work and how everyone struggles in those beginning stages. I think it makes it a little less intimidating." Marshall also utilized the help of her peers in the lab when she was applying for the Peace Corps. “They all provided wonderful, constructive feedback, which helped me improve and make my application more competitive,” she said. Marshall just received notice that she will join the Peace Corps in Gambia later this year working with an agriculture and sustainable food systems program. Carey credits the cultivation of high-achieving team members to the spirit of honors college students. Marshall is grateful for the opportunity she has had to work with the Glacier Lab team, as well as the opportunities she has received because of her experience in the lab.